The Munda languages of the northeastern quadrant of the Indian subcontinent are quite interesting because they are more closely related to the Austro-Asiatic languages of Southeast Asia than to the Indo-Aryan or Dravidian languages which are spoken by their neighbors. The Munda are usually classified as adivasi, which has connotations of being an ‘original inhabitant’ of the Indian subcontinent. More concretely, the Munda have traditionally operated outside of the bounds of Sanskrit-influenced Hindu civilizations, occupying upland zones and governing themselves as tribal units, rather than being a caste population. The term is a particular misnomer for the Munda because of the evidence that they are intrusive to the subcontinent from Southeast Asia. We have ancient DNA and archaeology which indicates that upland rice farmers, likely Austro-Asiatic, arrived in northern Vietnam ~4,000 years ago. This makes it unlikely to me that they were in India much earlier. The Y chromosomal data indicate that the paternal ancestry of the Munda derives from Southeast Asians, not the other way around. Surrounded by speakers of Indo-European, Dravidian and Tibeto-Burman languages, around 11 million Munda (a branch of Austroasiatic language family) speakers live in the densely populated and genetically diverse South Asia. Their genetic makeup holds components characteristic of South Asians as well as Southeast Asians. The admixture time between these components has been previously estimated on the basis of archaeology, linguistics and uniparental markers. Using genome-wide genotype data of 102 Munda speakers and contextual data from South and Southeast Asia, we retrieved admixture dates between 2000–3800 years ago for different populations of Munda. The best modern proxies for the source populations for the admixture with proportions 0.29/0.71 are Lao people from Laos and Dravidian speakers from Kerala in India. The South Asian population(s), with whom the incoming Southeast Asians intermixed, had a smaller proportion of West Eurasian genetic component than contemporary proxies. Somewhat surprisingly Malaysian Peninsular tribes rather than the geographically closer Austroasiatic languages speakers like Vietnamese and Cambodians show highest sharing of IBD segments with the Munda. In addition, we affirmed that the grouping of the Munda speakers into North and South Munda based on linguistics is in concordance with genome-wide data. The paper already came out as a preprint many months back, so I’ve already mentioned it. The big finding, to me, is that it uses genome-wide methods to estimate an admixture in the range of ~4,000 between the southern Munda Southeast Asian and South Asian ancestral components. It also confirms something that has been pretty evident for nearly ten years of genome-wide analysis of South Asian population genetics: the Munda have less West Eurasian ancestry even after you account for the Southeast Asian admixture than any mainland Indian population outside of the Tibeto-Burman fringe. The above figure is from a preprint (updated from last year), Recovering signals of ghost archaic introgression in African populations. But to truly get a sense of this preprint, I would highly recommend you read the supplementary material. And, to be honest, a publication from 2007, The Joint Allele-Frequency Spectrum in Closely Related Species, as the core of the method used in the preprint is developed in that paper. While introgression from Neanderthals and Denisovans has been well-documented in modern humans outside Africa, the contribution of archaic hominins to the genetic variation of present-day Africans remains poorly understood. Using 405 whole-genome sequences from four sub-Saharan African populations, we provide complementary lines of evidence for archaic introgression into these populations. 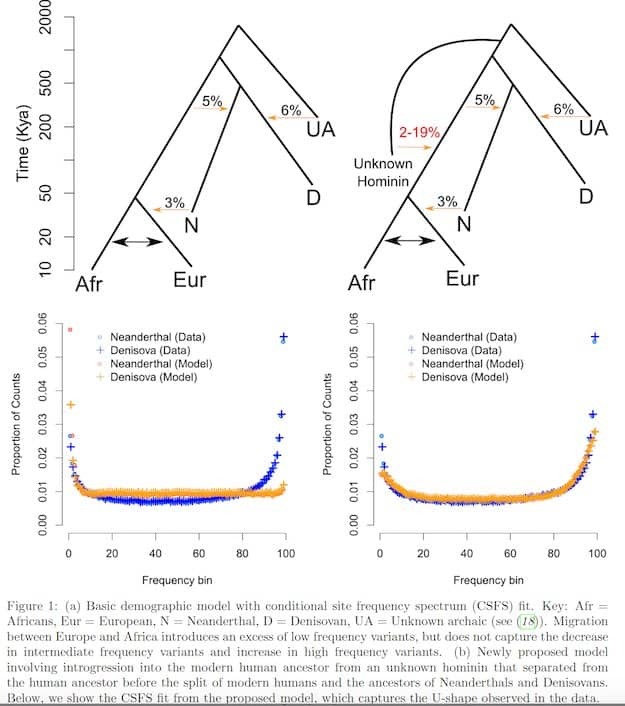 Our analyses of site frequency spectra indicate that these populations derive 2-19% of their genetic ancestry from an archaic population that diverged prior to the split of Neanderthals and modern humans. 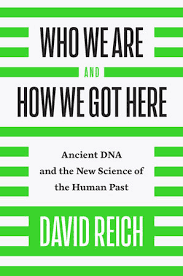 Using a method that can identify segments of archaic ancestry without the need for reference archaic genomes, we built genome-wide maps of archaic ancestry in the Yoruba and the Mende populations that recover about 482 and 502 megabases of archaic sequence, respectively. Analyses of these maps reveal segments of archaic ancestry at high frequency in these populations that represent potential targets of adaptive introgression. Our results reveal the substantial contribution of archaic ancestry in shaping the gene pool of present-day African populations. To get a sense of how much work went into this preprint, really do read the supplementary material. The step by step analysis convinced me pretty thoroughly that these results are not due to straightforward errors in the genotypes and classifications of the genotypes. Such things do happen, so it was nice to see them be very careful about that. The key point is that the distribution of the conditional site frequency (CFS) spectrum in West Africans does not align with theoretical expectations. The condition here being the state in the archaic outgroup, generally the Vindijia Neanderthal. The authors ran a bunch of simulations and models and found a subset that could produce the CSF they see, the u-shaped distribution. It is represented by the graph you see at the top-right. Basically, a scenario where a diverged archaic lineage which diverged from the other human lineages before the Neanderthal-Denisovan lineage left Africa contributed to the ancestry of West Africans within the last ~100,000 years (the most likely time is ~50,000 years ago). This is not a new finding at the highest level of generality. Jeff Wall has been beating this drum for nearly 15 years. 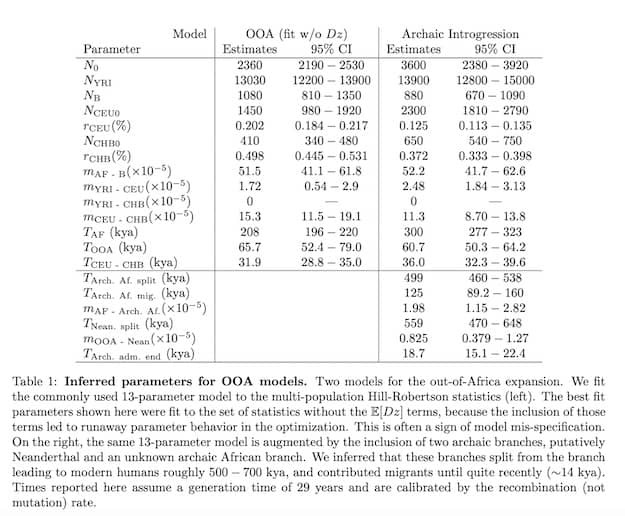 For example, Genetic evidence for archaic admixture in Africa. What has changed is that whole-genome sequencing, including high-quality sequences of ancient hominins, has allowed for a more robust exploration of the topic. The analysis of site frequencies was really not useful 20 years ago without genome-wide data. More data has allowed for more subtle methods. Demographic estimates are presented for the Aurignacian techno-complex (~42,000 to 33,000 y calBP) and discussed in the context of socio-spatial organization of hunter-gatherer populations. Results of the analytical approach applied estimate a mean of 1,500 persons (upper limit: 3,300; lower limit: 800) for western and central Europe. The temporal and spatial analysis indicates an increase of the population during the Aurignacian as well as marked regional differences in population size and density. Demographic increase and patterns of socio-spatial organization continue during the subsequent early Gravettian period. If you read The genetic history of Ice Age Europe you know the very first modern humans to arrive in Europe didn’t leave a genetic footprint in future populations. And the impact of both the later Gravettian and the Magdalenian seems to have been marginal. 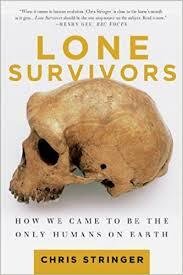 The primary “hunter-gatherer” contribution to modern Europeans is through a group which expanded after ~15,000 BC. In any case, there are two things that I observe in relation to the population estimates above. First, they aren’t that unreasonable for a large mammal which isn’t much of a primary consumer of plants. Second, such a small and fragmented population indicates that extinction is always a possibility. You can take a standard conservation biological view and just assume statistically that small fragmented groups are likely to extinct over enough generations. 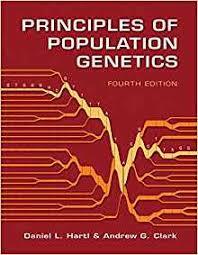 Or, you can point out that genetically such small breeding populations (remember that the genetic breeding effective population is always smaller than the census population) are likely to build up deleterious alleles, and that’s probably going to result in a decrease of long term fitness. In other words, I think localized mutational meltdowns would be possible in this scenario. The small populations during this period are not surprising. 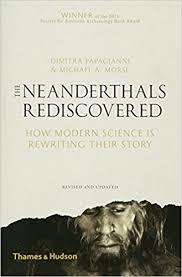 Many of the Neanderthal, Denisovan, and hunter-gatherer (e.g., the first WHG sample) populations had small sizes that led to homogeneity genetically and inbreeding. You see it in the homozygosity data and the runs of homozygosity. 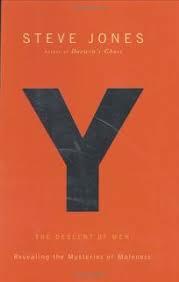 Ultimately, it was the larger population sizes due to agriculture which changed things in a fundamental sense. 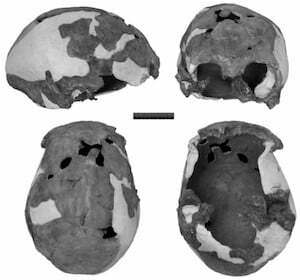 This makes me wonder what was so advantageous about these marginal modern humans which allowed them to overwhelm and absorb the older Eurasian hominins? The study of runs of homozygosity (ROH), contiguous regions in the genome where an individual is homozygous across all sites, can shed light on the demographic history and cultural practices. We present a fine-scale ROH analysis of 1679 individuals from 28 sub-Saharan African (SSA) populations along with 1384 individuals from 17 world-wide populations. Using high-density SNP coverage, we could accurately obtain ROH as low as 300Kb using PLINK software. The analyses showed a heterogeneous distribution of autozygosity across SSA, revealing a complex demographic history. They highlight differences between African groups and can differentiate between the impact of consanguineous practices (e.g. among the Somali) and endogamy (e.g. among several Khoe-San groups). The genomic distribution of ROH was analysed through the identification of ROH islands and regions of heterozygosity (RHZ). These homozygosity cold and hotspots harbour multiple protein coding genes. 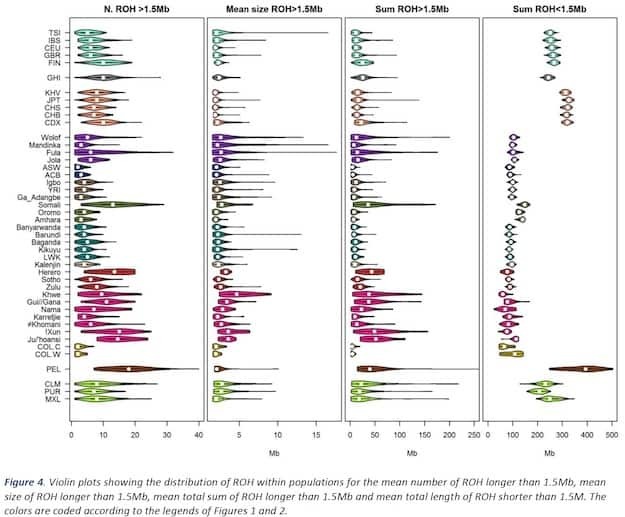 Studying ROH therefore not only sheds light on population history, but can also be used to study genetic variation related to the health of extant populations. This sort of run-of-homozygosity analysis is enabled by high-density genotyping or whole-genome sequencing. After quality control, the authors had 1 to 1.5 million SNPs for all populations. The interesting thing about this preprint is that by looking at the violin-plots can you can see exactly all the things that population geneticists have learned about the demography, structure, and history of humans in the past generation or so. The rightmost panel shows the average total length of short ROH. Partly the pattern fits into the older serial bottleneck model of the settlement of the world. The pattern of Amerindian > East Asian > European > African. But what about the lower fractions for mixed Latin Americans and Gujuratis? This is a consequence of admixture, as these populations are mixtures in a sense of other groups. The length of the long ROH segments, the second to last panel on the right, is indicative of recent patterns of marriage. Within Africa, you see some groups have many individuals with lots of long ROH segments. This is because of consanguinity. As the authors observe, the Oromo and Somali are both Cushitic speaking groups from the Horn of Africa, but the latter are universally Muslim, while only a minority of the former are. Islamic cultures have traditionally encouraged consanguineous marriages, and you can see the difference between these groups (whose total length of short segments is similar). The pattern of ROH here can be predicted by simple genetic models: the extent of random mating within populations, recombination rates across the genome, and total population size. What modern genomic technology does is provide data to test the models. Skin color is important and interesting. It is important because people think it is important. Humans often classify each other by complexion, and it has a high social importance in many cultures. This tendency starts at a very young age. When my children are toddlers they’ve all misidentified photographs of black American males with a medium brown complexion as their father (for example, my son recently misidentified a photograph of me that was actually the singer Pharrell). In terms of my background though, I’m 100% Eurasian in ancestry. On a PCA plot, I’m about halfway between Europeans & Near Easterners and East Asians (I have 15% East Asian ancestry so I’m more shifted to East Asians than the typical South Asian). 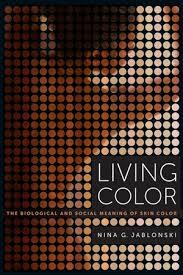 Luckily, for a characteristic that we’re fascinated by, pigmentation has been reasonably tractable to genetics. 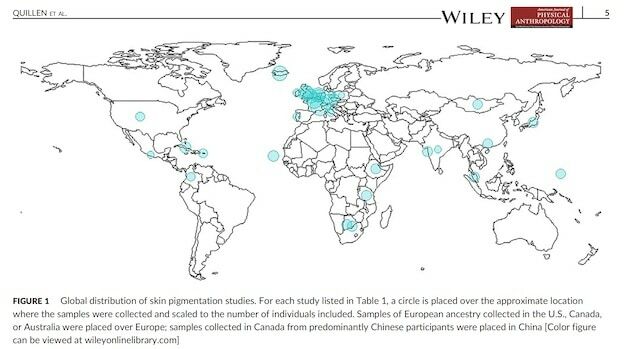 As early as the 1950s human geneticists using classical methods of pedigree analysis predicted that pigmentation was polygenic, but that most of the variation was due to a small number of loci (see The Genetics of Human Populations). In particular, they focused on families of mixed European and African ancestry in British ports with known pedigrees. When genomic methods came on the scene in the 2000s, pigmentation was one of the first traits that yielded positive GWAS hits as well as population genetic findings related to natural selection. 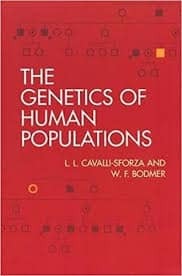 In Mutants, written in the middle aughts, the author observed that there wasn’t much known about the basis of normal human variation in pigmentation. 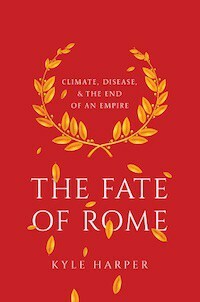 This all changed literally a year after the publication of this book. 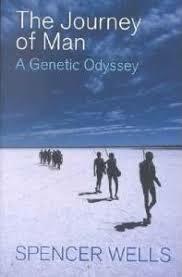 By the middle of 2006, a review paper came out with the title, A golden age of human pigmentation genetics. 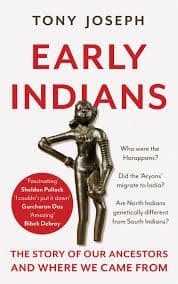 The reason this paper was written is that a host of studies on European populations had identified several loci which explained a substantial proportion of the intercontinental difference in pigmentation between Africans and Europeans.